It is safe to say that the lull in the Toronto and area residential resale market is not due exclusively to the summer doldrums, although the seasonal slowdown that happens every year in July and August is no doubt adding to the slow market. In July, 5,921 residential properties were reported sold for the greater Toronto area. That is a far cry from the 9,929 properties reported sold for the same period in 2016, a decline of more than 40 percent. July was the second month in a row when year-over-year sales declined by more than 35 percent. Average sale prices continue to be higher than the same period last year, but not by the staggering increases that we experienced earlier in the year. In July, the average sale price came in at $746,218, 5 percent higher than the average sale price of $710,471 achieved last year. The average sale price for the greater Toronto area is down dramatically from prices achieved at the beginning of this year. For example, the average sale price for all properties sold in April was $919,449. Since then the average sale price has decreased by almost $175,000 or more than 18 percent. This unprecedented rapid decline in average sale prices has put tremendous pressure on lenders trying to determine current fair market value. As a result, buyers who purchased closer to April with closing dates in late June and July are having trouble funding their purchases as lenders reduce the amount they are prepared to loan based on the declining value of properties. Although this is a temporary and transitional period it is an unpleasant place to be if you are a seller who has bought and is having difficulty selling in the face of rapid declining average prices or a buyer whose financial institution is reassessing the amount of financing it is prepared to advance. Buyers, who have hit the pause button, waiting to see how far prices will drop before they re-engage have more choice than they have enjoyed for a number of years. 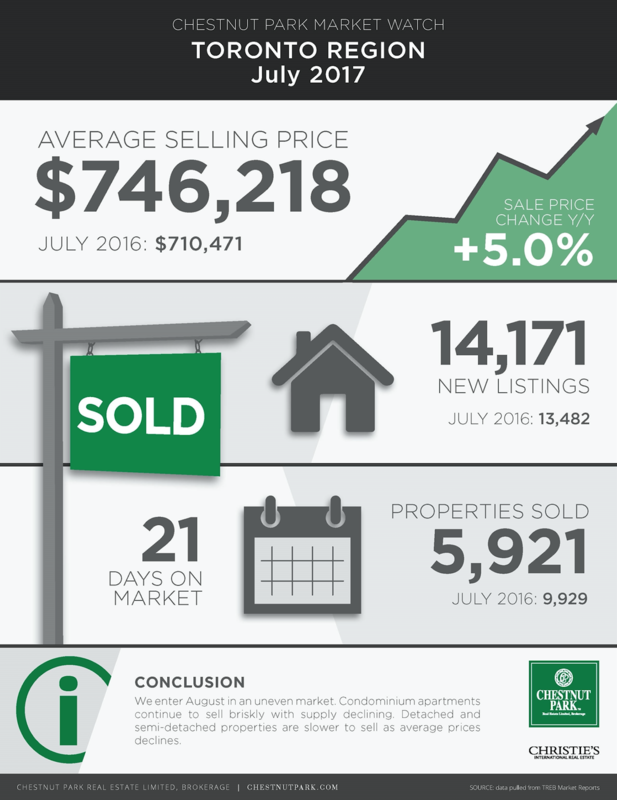 In July, 14,171 new listings came to market, 5.1 percent more than the 13,482 new properties that came to market last July. Added to the increase in inventory in May and June, at the end of July there were 18,751 properties available to buyers in the greater Toronto area, more than 65 percent than the paltry 11,346 properties available in July last year. Although the difference in the number of available properties this year compared to last is stunning, on a 12-month moving average at the end of July those 18,751 active listings still represented only 1.3 months of inventory. A balanced market is represented by 3 to 4 months of inventory. If the market picks up in the fall, as is expected, supply could once again become a problem. Buyers are taking longer to make decisions about buying properties. In July, all properties sold (on average) in 21 days. Last year it only took 16 days for all properties to sell. Detached properties appear to be taking longer to sell than semi-detached and condominium apartments. In July, it took 22 days for detached homes to sell. Semi-detached properties sold in only 19 days and condominium apartments sold in 20 days and only 19 days in Toronto’s central districts where most of the condominium apartment supply is located. The only explanation for this difference is price-point. Less expensive properties continue to sell quickly. This is clearly the case with condominium apartments, where a supply problem is developing. In July, there were 2,710 condominium apartments for sale in the City of Toronto. Last year there were 3,307 apartments. We enter August with 29 percent fewer available condominium apartments for buyers to buy. There will be tremendous pressure on condominium apartment prices, as more buyers begin competing for an ever-shrinking inventory in the fall. It’s not surprising therefore that in Toronto all condominium apartments sold for 100 percent (on average) of their asking price in July. The change in the residential resale market and the speed with which it has changed is very confusing. There has been no change in the economic fundamentals between mid-April and the end of July, yet the market is substantially down in average price and in volume. The provincial foreign buyer tax in itself cannot be responsible for this tectonic shift. By the government’s own admission, foreign buyers represented only about 5 percent of all sales. This is a classic example of the market changing because of psychology. But at the end of the day, the demand that was in the market in April is still there today, and at some point in time, perhaps when buyers perceive that the button has been reached, those buyers will be back in the market, perhaps not as exuberantly as before, but they will be there. We enter August in an uneven market. Condominium apartments continue to sell briskly with supply declining. Detached and semi-detached properties are slower to sell as average prices decline.